It’s bound to happen at some point, right? Let’s look at the odds for your Myrtle Beach golf holiday hole in one: statistics show that you should have a hole in one every 3,000 rounds that you play. Now, that equates to 100 rounds of golf for 30 years and you are due a hole in one. Did you just read that right? Yes – statistically speaking you should have an ace every 3000 rounds you play. Who plays 3000 rounds in a lifetime - besides professionals? There are not many who will play that many rounds of golf, so when you have your Myrtle Beach golf holiday hole in one – you need to realize the rarity and celebrate properly! A Myrtle Beach golf holiday hole in one is the ultimate, so let’s briefly mention what you should NOT do: Quietly pick up your ball out of the hole, say thanks to your playing partners and move along to the next hole. This is a once in a lifetime opportunity – the “holy grail” of golf shots – it needs to be treated as such! You just hit the perfect shot in a game that perfection is pretty much unattainable. It’s time to cut loose…. Regardless of your age (this goes for the young kids to the seniors with a head full of knowledge and gray hair) – you need to go a little crazy – jump around, whoop and holler and pump your fists! Hell, if this happened for me (never has….yet) I’d be jumping around the green like a whooping crane getting ready to take off for flight! Don’t let your playing partners be more excited for your Myrtle Beach golf holiday hole in one than you are….. Think about it this way: Life is full of unexpected surprises – most of them might not be that pleasant…. This one is – so act like it! 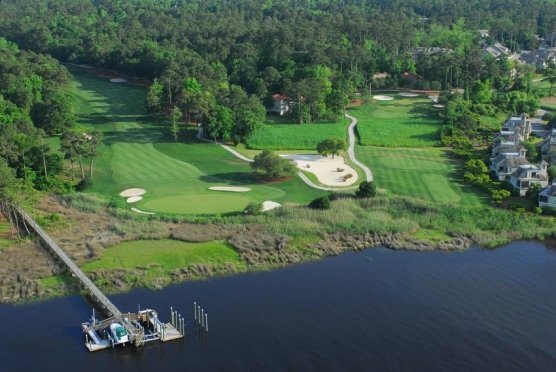 Part of the Myrtle Beach golf holiday hole in one tradition is that the person who makes the ace, then buys the house a round. We think that may be a little excessive, so we suggest you trim that down just a bit and buy your playing partners a round. Be sure to designate a driver or call a cab – you don’t want to ruin your Myrtle Beach golf holiday hole in one with an accident or a visit to the police station. Whatever your celebration includes for your Myrtle Beach golf holiday hole in one, make it a good one – these things don’t happen that often!